We’d like to thank our gracious host for having us over today. We’re happy to share with you a little bit about our blossoming company and you’ll get to know more about the team that makes the machine that is Rebel Ink Press run smoothly. 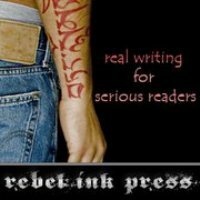 Rebel was born in August 2010, the brain child of five friends that envisioned a portal into the publishing world where writers were treated like people rather than a number. A place where they could grow and learn and hone their skills, flourish, all while having an open line of communication with said publisher without fear of never getting an answer or being told not to worry. A couple of us were previously published and understood that worrying is a natural part of the publishing cycle on the part of the writer and isn’t to be taken lightly. After all, these works are writer's children, being sent into an often times critical world, and worrying is just a natural part of that. As a company, Rebel strives to provide readers with stories they want and while offering the services authors deserve. We're committed to good citizenship, fair business practices, and developing up and coming authors through editorial support, marketing and promotion--all of which help authors create their best works possible. Our philosophy must be working because here we are a year later, Rebel strong! We now house over sixty writers and our inbox is a busy place. We currently have eighty plus titles available at ARe, Amazon, Barnes and Noble, Coffee Time Romance and Bookstrand, and we’re looking to expand our vendor list in 2012. Our release calendar is full and our first quarter of 2012 is busting at the seams. In fact we’re looking to double our available titles this year. Our writers are gleaning rave reviews and several are bestsellers at ARe, to date they’ve earned twenty-one of those coveted silver stars. At Rebel our promise to ourselves was to provide the Cadillac of customer service to our writers. Yes, our writers. They enjoy benefits under our roof not often offered through small presses, such as the services of a professional cover artist, marketing opportunities arranged through our public relations department, professional editing services by a half-dozen plus hand-selected editors, graphic arts help, and we have an in-house review coordinator. Our ARCs are sent out in advance of release to reputable and safe reviewers so we have feedback for our writers to grow on. As a result, we’re growing, too. By leaps and bounds. Again we’d like to say thanks for hosting us today. If you have questions, please leave them in the comments section or email us at editor@rebelinkpress.com . We’d be happy to answer them. For more information about us, our writers and their works, or for submissions guidelines please find us at here. You can also follow us on Facebook, we’d love for you to find and follow us on Twitter @rebelinkpress and we just opened our YouTube channel. Isn’t it time to get serious? Tour hosted by Bewitching Book Tours.